Kentucky ice cream hot spot Chaney's Dairy Barn went National this week, national TV that is. 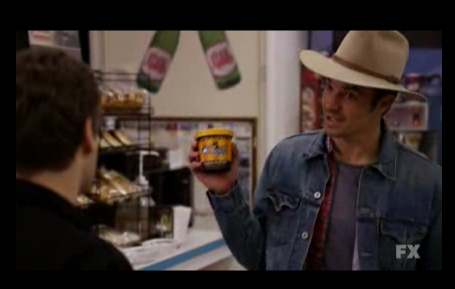 My beloved FX show "Justified" shows US Marshall Raylan Givens (Timothy Olyphant) using a pint of Chaney's as a distraction as he sneaks out the back door to go do a little investigating on his own. Being me, I immediately went to investigate this mysterious ice cream as soon as the show was over. I had a little trouble guessing the spelling, but I got there, and sure enough, my suspicions were confirmed when Chaney's posted the above picture. I'm guessing the use of Chaney's has much to do with the fact that they were picked by USA Today as the best spot in Kentucky. Ofcourse, the real Harlan is over 200 miles east of Bowling Green, and to be honest I'm not even 100% sure those pints even exist, but either way, you can't beat free publicity! Only two more episodes left of season 2 of Justified, but don't worry, there will be a season 3!